High-end PC gaming and travel don't usually mix well. The best gaming laptops are invariably super-heavy monsters with 15 to 17-inch displays. As much as anything, the large sizes are usually needed to accommodate all the hardware top-tier games need to run without cutting down on graphics quality or performance. Eurocom's M3 might just be the solution to that problem. The new gaming rig features a 13.3-inch full HD matte 1920 x 1080 display, a Core i7 Haswell processor (up to a Core i7 4930MX Extreme), and very respectable NVIDIA GeForce GTX 765M graphics. Other specs include up to 16 GB RAM, up to 2.5 TB of internal storage (SATA3, 2x mSATA3, 1x HDD/SSD), a backlit keyboard, Sound Blaster Cinema, and enough ports and connectivity options to satisfy just about anyone. While similar internals are available in other products, the M3 really seems to deliver on the promise of portable gaming: the Canadian company has managed to squeeze all these features into a frame that measures only 13.2 x 9.9 x 1.2 inches and weighs just 4.4 pounds, all while offering up to 5 hours of battery life. 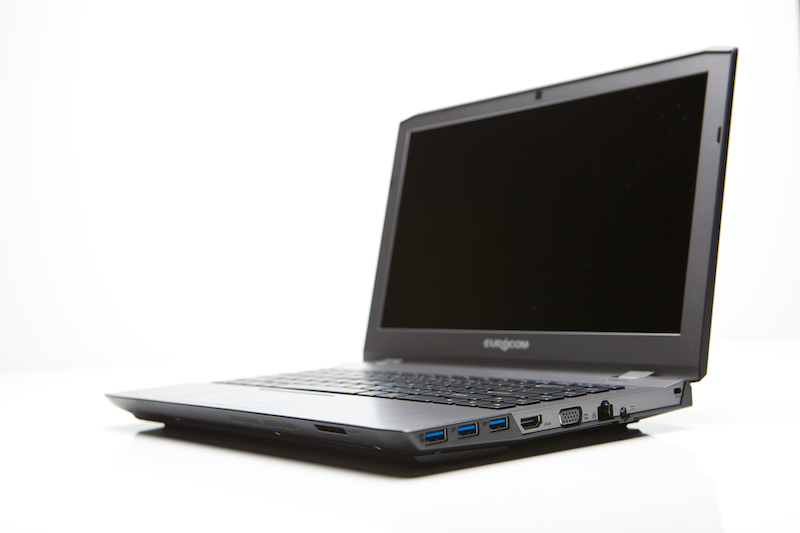 The M3 is available for order now from Eurocom's website. Prices start at US$1100 for a model with 8 GB RAM and a Core i7 4700MQ processor.